The current configuration for fireworks viewing is annoying for photographers, because there is a constant stream of pedestrians in front of the very front of the viewing area. This deprives anyone seeking to photograph any fireworks show of a clear line of sight of the castle and the bursts beyond, which is especially a bummer now that Disney has incorporated projections into their old shows they've brought back. 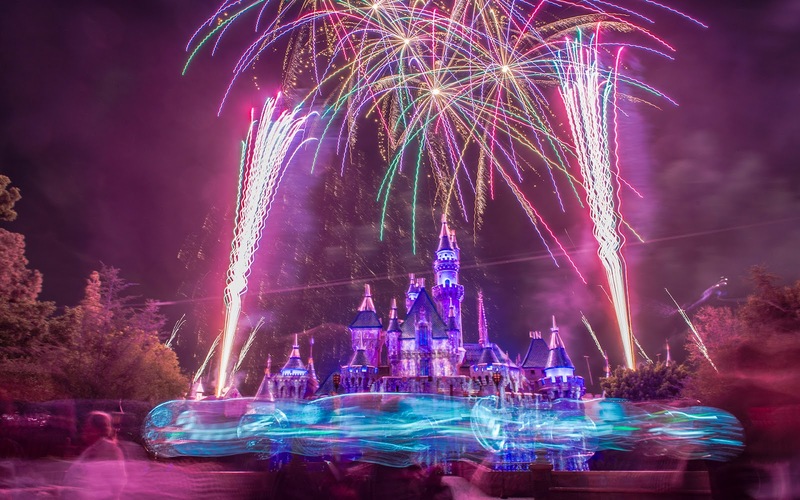 On the other hand, occasionally, some happy accident happens, and you get a shot that kind of looks like lightcycles racing in front of Sleeping Beauty Castle. And in cases like that, you take annoyances with the benefits. Light trails both in front of and behind the castle.